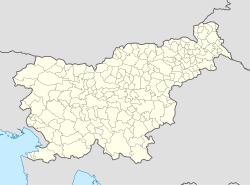 Sovinja Peč (pronounced [sɔˈʋiːnja ˈpeːtʃ]) is a small dispersed settlement in the hills immediately south of the Črnivec Pass in the Municipality of Kamnik in the Upper Carniola region of Slovenia. This article about the Municipality of Kamnik in Slovenia is a stub. You can help Wikipedia by expanding it. This page was last edited on 3 March 2019, at 14:01 (UTC).